It's been a few weeks since I wrote about some of my old mistakes working on Singularity, and I think it's time for a little follow-up. I've implemented all of the changes that I mentioned (and they work), so I'll be discussing two "smaller" features that I've been working on and what I've learned by working on them. One big problem that I've had in this new version of Singularity is how opaque it is about everything. Before I started working on it again, there was no way to see if any feeds failed to load, or where feeds pointed to. As a result, a feed could go down and silently fail for months while you were none the wiser! Since I'd identified this problem before I started work again, I was already planning to do something about it. To keep things simple, I'm just making the text in the feed sidebar stand out more for now. So that's the first piece of this puzzle. However, there remains one big problem: What do you do when you know a feed doesn't load? I knew that I had a large number of broken feeds, but without somewhere to see the url it would be difficult to know if the feed had moved or been deleted, or if it was just a parser error. I'm still mulling over the best solution to the problem. For the moment, I've created a properties page for feeds that contains info like the title and url. This works fine, although it could still use some polish. Another feature that I'm considering is an 'update status' indicator that could display detailed update progress and error messages. Either way, it's clear that Singularity needs to provide more feedback when things fail. Lesson Learned: Detailed feedback can be very important, and not just as polish! I'm nearly done with a new feature that, apparently, is one of the most important things to add. 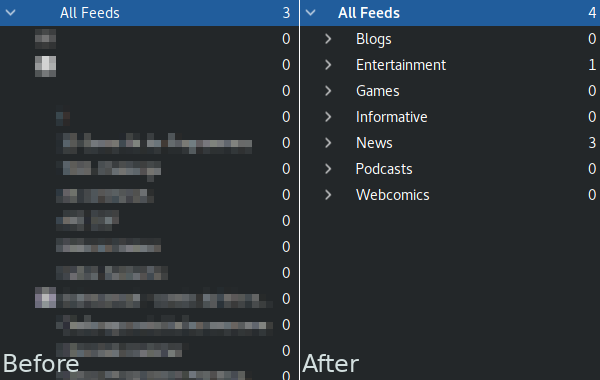 When I started rewriting Singularity a while back, I wanted to add folder-like entries to the sidebar so that users could organize their feeds. This seemed like more of a "would be nice" feature than an absolutely vital one, so it was left in a half-finished state. In the left image, you know nothing other than the fact that there are 3 unread items of some description. What are they? How long will it take to read them? Do I care right now? The program has no answer for you, because the feeds with new items are hiding under 100 others. Even if they were at the top, you could have 30 feeds with one update each. Instead of hunting around, the most obvious solution is always just to click 'All Feeds' and read through everything. The picture on the right gives much more info. Right off the bat, you know that 3 of the new updates are news articles. If you're about to head out then you probably don't want to check them yet, and you don't have to. It suddenly makes a lot of sense to check the categories that interest you, and leave the stuff you don't want to check for later. I'm glad to have this new feature, but I'm kicking myself over how many months I suffered without it. Now that it actually makes sense to check things that aren't 'All Feeds', I've also added a small quality-of-life feature: Item views now display the feed/collection that they correspond to. It's a minor thing, but it's nice to have. Lesson Learned: Just because the user always does something doesn't mean that it's the only way they ever will. Some habits may be a result of weak design. For the first time in quite a while, I feel happy and optimistic regarding Singularity's future. My last rewrite ending halfway put me in a spot where I was unhappy with the result, but the polish and new features feel like a much-needed breath of fresh air. My goal of a new release by the year's end is starting to look much more realistic!